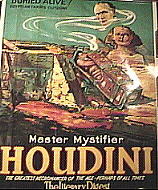 Poster 2 is an advertisement for Houdini's "metamorphosis" illusion. It measures 13" x 19". Poster 3 is the "King Of Hearts" and measures 20" x 26". Poster 4 (shown here) is the "Buried Alive Escape" and measures 21" x 27". On the reverse side of this poster are photos from Houdini's movie performances.